Part of Rotary’s success and global impact is due to its emphasis on local participation and input. Rather than trying to solve a problem from an ocean away, Rotary empowers local communities to take ownership of the issue and solve it on their own. Rotarians understand that service begins at home. Our Rotary family excels at identifying local challenges and finding ways to address them. In 1991, Rotary introduced the Significant Achievement Award to honor outstanding service projects carried out by clubs in their communities. Last year 145 clubs from 40 countries received the Significant Achievement Award in recognition of exemplary community service efforts. Among the recipients were clubs large and small, and the projects they undertook were even more varied and ambitious. What they all had in common, however, was that they addressed a significant problem in their local community, involved most or all of their club membership, and that the selected projects were commensurate with the size and the resources of their club. 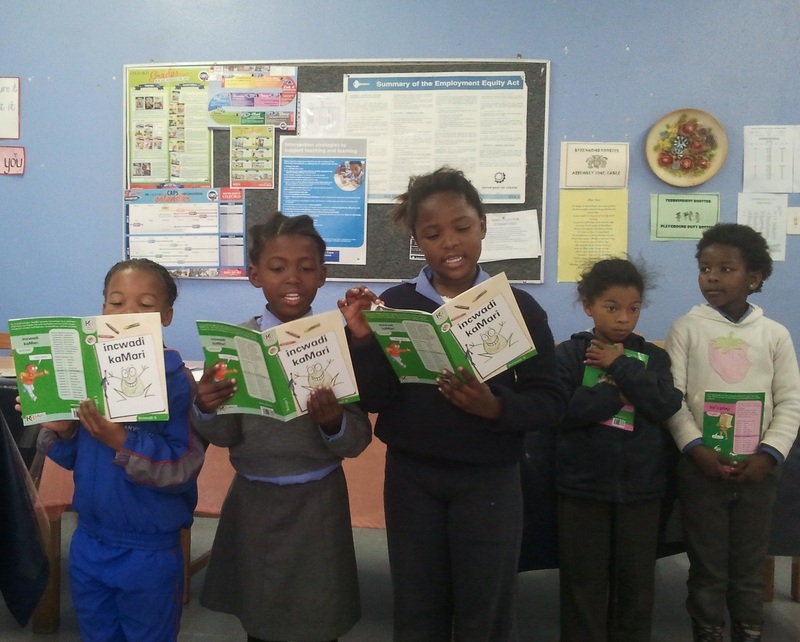 Marvin Park Primary School students reading books provided by the Rotary Club of Helderberg Sunrise. In order to address child illiteracy in the community of Helderberg, South Africa, the Rotary Club of Helderberg Sunrise initiated the “Literacy for All” project in 2010. By involving the majority of their membership, they were able to undertake an ambitious fundraising campaign both domestically and abroad. The funds were used to train teachers and to provide books in eleven official languages for children in ages 6-8. The club also applied for and received two Matching Grants from the Rotary Foundation. Within three years the project helped more than 5,000 children learn how to read and write in their native languages. The project even inspired other South African Rotary clubs to carry out similar projects in their own communities. Sedro-Woolley Skate Park grand opening on October 13, 2013. Photo courtesy of Bob Rock. 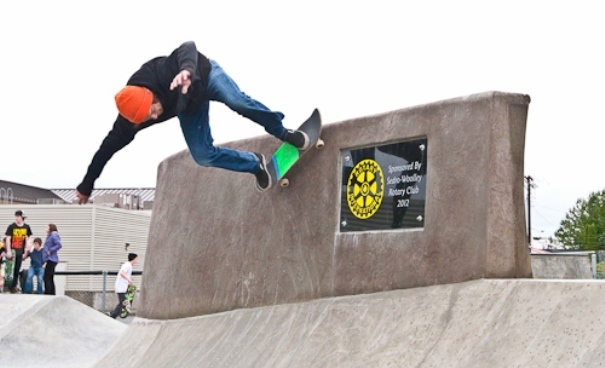 To help provide safe recreation space for youth, the Rotary Club of Sedro Woolley, Washington, USA, led the construction of a local skate park. The club members first met with youth in the community and made sure to involve them in the planning phase of the project. The first planning meeting took place in December 2011 and construction began in July 2012, funded with the support of local businesses, foundations, and individual donors. The skate park was opened to the public in October 2013. Watch a video about this project. While the outdoor space of an elder care facility, in Bjerringbro, Denmark, was big enough for 25 residents, it was not providing a comfortable environment for residents suffering from dementia. Inspired by scientific research, the Rotary Club of Bjerringbro decided to create a “Garden of Senses” in May 2012. The garden was designed to include fragrant bushes, perennial flowers, fruit trees, and some cultural elements that would create a better and more soothing outdoor experience for the residents. Club members divided into eight different teams and were assigned various tasks such as arranging water sections, terraces, and paths, fencing, soil improvement, and planting. In total, the club contributed 525 volunteer hours to complete the project. See a complete list of Significant Achievement Award recipients by district. We’re currently accepting Significant Achievement Award nominations from district governors for the 2013-14 award. If your club conducted an impactful community service project during the 2013-14 Rotary year, contact your district governor to be considered for this award. District governors may select one outstanding project from their district and submit their nominations to riawards@rotary.org by 15 March. Eligibility requirements and procedures can be found in the nomination form. Learn more in Communities in Action: A Guide to Effective Projects and Community Assessment Tools. Planning new service projects? Consider Rotary’s six areas of focus. Visit ideas.rotary.org, Rotary’s crowdsourcing tool, to share project plans, find partners, and request volunteers, funding, and materials and enhance your capacity to serve others. Feature your completed projects on Rotary Showcase or view Rotarian-led completed initiatives impacting communities around the world.